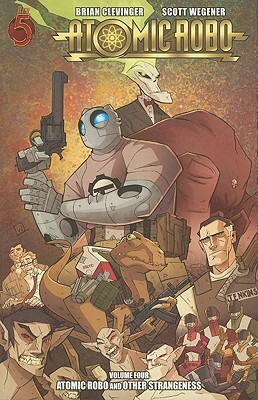 Apparently, a week in the life of Atomic Robo is chock-full of insanity, contradictions, and science fiction hilarity. By the time readers finish this fourth volume of his exploits, extradimensional vampires, ghosts, super-mega robot guns and a giant mega crab have all been dealt with. Oh, and Dr. Dinosaur. Atomic Rob and Other Strangeness starts off in 1999 with a job interview that becomes unhinged by the chaos of one of Tesladyne's labs breaking into another dimension and unleashing vampires throughout the complex. Once that situation's dealt with, Robo goes to Japan to ask a favor from one of their super-scientists--but not before assisting their Power Rangers knockoff team in taking down an super-angry giant crab monster. Then, Dr. Dinosaur appears in French Polynesia, and he and Robo debate whether or not Dino is a.) smart, and b.) a time traveler while they simultaneously try to kill one another. Finally, we come back to Tesladyne while Robo and his people try to solve the mystery of why a ghost-like image keeps appearing all over the complex. It's right about then that we find out that all of the events in this volume have happened in a single week. The overall aim of these comics is clearly entertainment, and for my part, Atomic Robo delivers. While there are some stories I enjoyed more than others in this volume, they were all good, and they all demonstrate the creators' adeptness at packing a whole lot of sci-fi slapstick and just a smattering of science babble into their wacky tales. Atomic Robo combines an enjoyable blend of sarcasm, action, and flat-out over-the-top humor to make for a highly readable and amusing experience. There are quite a few memorable moments in this volume, from Jenkins throwing down on some vampires with ridiculously brutal efficiency, to Robo's verbal sparring with Dr. Dino about his "origin story" and intellect as they try to kill each other, to his knock-down, drag-out verbal assault on Tesladyne's ghostly guest once he finds out who it is. There's also a pretty amusing shout-out to Japanese anime and sci-fi cartoons and programs in the Science Team Super Five, with a ridiculously perfect team of brilliant scientist soldiers, mecha-robos, and a giant, biomega-powered crab monster with a grudge to avenge. Brian Clevinger clearly has as much fun writing across all these various tropes and settings as Scott Wegener seems to enjoy drawing it. Speaking of the art, Wegener continues to draw entertaining book illustrations in his trademark style while demonstrating versatility in handling different subjects and locations during the course of Robo's week. His vampires look gruesome and threatening, his Dr. Dinosaur looks lizardy and his skeleton ghost looks sinister and unsettling. It's a definite fit for the writing, and accounts visually for the entertainment value conveyed in the stories' writing. Overall, I'm enjoying this comic. The writing isn't particularly deep, but it makes no pretensions about being so, and revels in the amount of slapstick entertainment it delivers. I still need to get my hands on the first two volumes, and can't wait to do so. If you're looking for good escapist fare that will make you laugh out loud, get yourself a copy of Atomic Robo. Highly recommended.